The evaluation unit changes the frequency signal of the pickup into a 3(4)-digit flow reading with selectable measuring unit and into a scalable analogue signal. The two threshold value relays with floating output changeover contacts continuously monitor the flow to check if the freely settable limits are exceeded or fallen short of. Here, it is possible to select either threshold value or window monitoring. The switching point, the hysteresis, a window point and the switch on or off delay can be set separately for each relay. The switching points can also be set directly using the control keys without having to switch over into the menu. A red LED indicates the switching statuses. The bottom line of the display shows a bar graph of the flow readings. 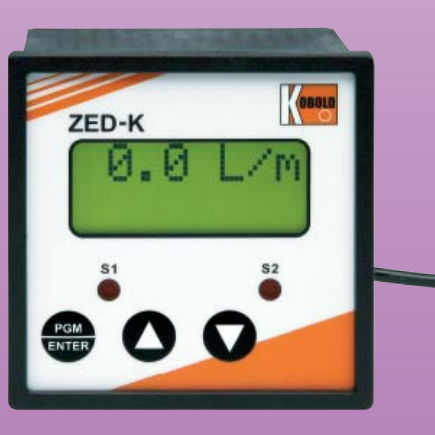 The analogue output is available as current output with 0(4)...20 mA or as voltage output with 0...10 V. The parameter names in the menu can be shown in German or English. If used where the flow readings change rapidly, the display can be pacified and the analogue reading averaged by switching on some software. A MIN/MAX reading memory determines the extreme values of the flow. The display of the readings and the resetting are achieved by using the keys, without having to change into the menu. Resetting by using the keys can also be blocked. If the maximum set flow (exceeded range) is exceeded, it will be shown on the display. The set parameters can be protected against unauthorised alteration by using a password function.